Paul Gauguin (1848 - 1903), Crouching Tahitian woman seen from the back (Field 75). LONDON.- This morning at Sotheby’s in London , ten prints by Paul Gauguin from the Collection of Stanley J. Seeger, sold for £1.54 million ($2.47 million), almost four times the pre-sale low estimate for the group. 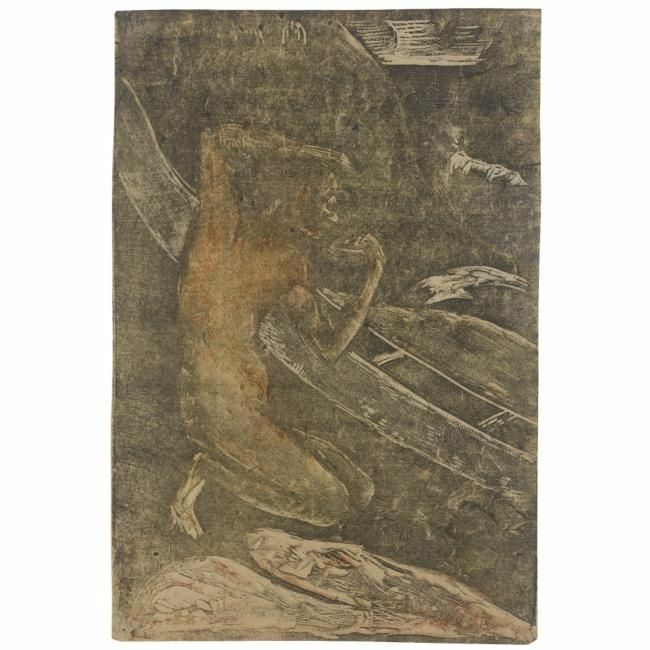 A new auction record for a print by Paul Gauguin was achieved when Crouching Tahitian Woman Seen From The Back sold for £577,250 ($924,466), over three times the estimate (£180,000-220,000). 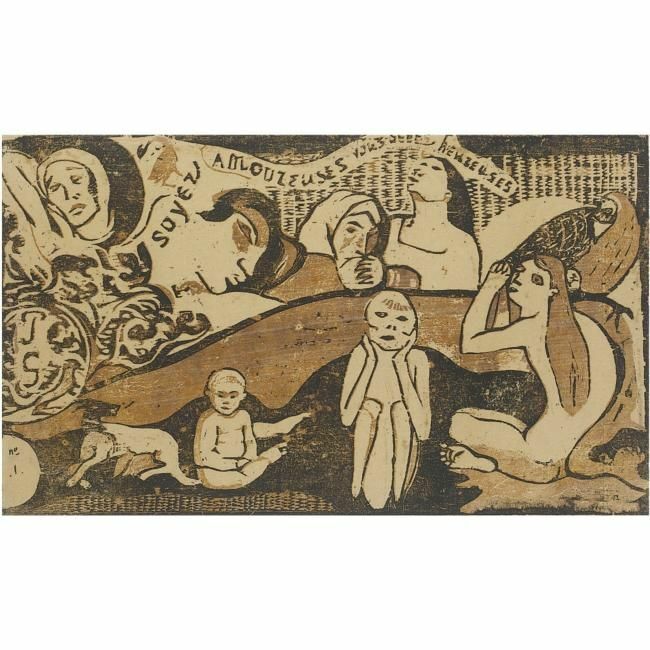 The traced monotype, or ‘printed drawing’, was fiercely contested by a number of determined bidders, finally selling to a private collector on the telephone after a five-minute battle. Earlier in the sale, there was much excitement surrounding a pair of rare woodcuts by Albrecht Dürer – widely considered the greatest artist of the Northern Renaissance. The earliest printed star charts, A Map of the Northern Sky and A Map of the Southern Sky, sold for £361,250 ($578,542) to Daniel Crouch Rare Books, over three times the low estimate. The price achieved established a new record for a woodcut by Dürer at auction. These two celestial maps are the oldest printed star charts published in Europe. Dated circa 1515, they were produced in Nuremberg under the patronage of the Holy Roman Emperor, Maximilian I, and were the product of an innovative collaboration between Dürer, the eminent Viennese mathematician, cartographer and astronomer Johannes Stabius and German astronomer Conrad Heinfogel. The woodcuts depict the northern and southern skies known to European astronomers at the time, and combine with great skill the accuracy of the stars with constellation figures as visualised by the Greeks and Romans. There are only ten other examples of the 1515 star charts extant in institutions worldwide, and the present set – estimated at £120,000-180,000 – is one of only three recorded with contemporary hand-colouring. Aided by Dürer's reputation, these star maps were highly influential and became a source of inspiration for successive mapmakers. Distilling iconography influenced by Antiquity, Greek geometrical studies and Islamic scholarship, the woodcuts display Dürer's virtuosity and interest in science and mathematics. The maps show the stars of the forty-eight constellations based on Ptolemy's second century star catalogue, the Almagest. Early western maps of the skies showing both stars and constellation figures appeared circa 1440; however, the present maps were the first to chart a coordinate system with accurate placement of the stars. They attest to the role that Nuremberg played as a centre of printing as well as for the manufacture of scientific instruments. The map of the northern hemisphere is richly decorated with the twelve signs of the Zodiac, to be read counter-clockwise. Four ancient authorities appear at each corner of the northern chart, each in their national dress, holding a celestial globe: Aratus representing the Greek, Ptolemy the Egyptian, Al-Sufi the Islamic and Marcus Manilius the Roman tradition of astronomy. The map of the southern hemisphere displays distinctly fewer stars and constellations. At the time, Europeans had not yet charted the southern sky; this is reflected in the pared down composition of the map, with its areas of vacant constellations. NOTE: I have just done a series of experiments in drawings with which I am fairly well pleased, and I am sending you a tiny sample. It looks like a print, but it isn't. I used a thick ink instead of pencil that's all. Paul Gauguin, 1900, in a letter to Ambroise Vollard. 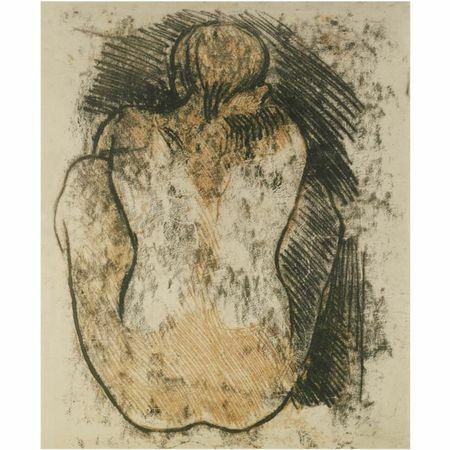 The Crouching Tahitian Woman seen from the Back was printed in the Marquesas, where lacking any form of printing press, Gauguin continued to explore and develop the technique of the traced monotype. 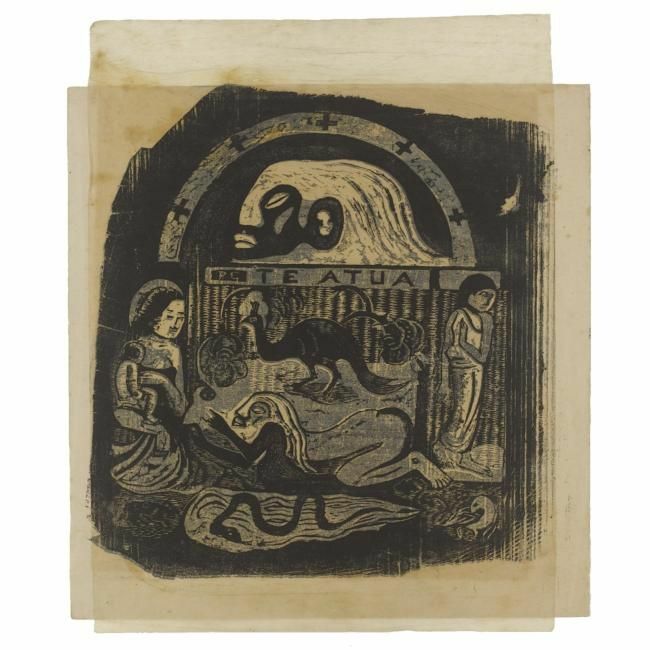 Initially employed as a cheap and easy method for the duplication of drawings, the monotype replaced the charcoal and pencil drawings produced during the last four years of Gauguin's life. A traced monotype involves tracing a design onto a sheet of paper which has been placed over a heavily inked sheet. The pressure of the drawing tool on the reverse of the top sheet picks up the ink of the second sheet underneath. Once the traced sheet is peeled off the inked sheet, the verso of the top sheet reveals the traced monotype and finished print. The generic pose references Gauguin's painting Tahitiennes sur la plage (Wildenstein 462, Metropolitan Museum of Art, Robert Lehman, New York), made in 1892. 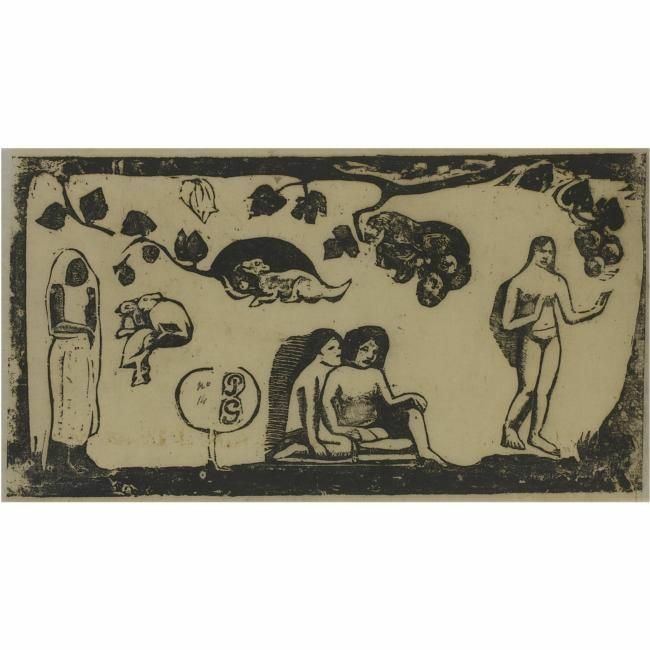 In its present form, however, the print is a prototype of an idea that is perfected in the 1902 painting Femme Accroupie (W. 613, today lost) and L'Appel (W. 612, Cleveland Museum of Art). It is possible that the present work is a study in preparation for these works. The process of tracing, repeating, reversing and changing scales was fundamentally a process of transformation and was essential to Gauguin's oeuvre. This can be seen in his explorations through different media which repeat the same motif: a drawing (exhibited in the recent Gauguin exhibition at the Tate, Private Collection, provenance Andre Fontainas), a traced monotype (printed in black only, sold at Christie's New York, 1997, lot 106, $266,500) and a gouache monotype of 1902 (Field 133). Careful examination of Crouching Tahitian Woman reveals the white lines of the hid quarter of a dog, which is a trace of a lost monotype (Field 74); this enhances the rich complexity of the work. 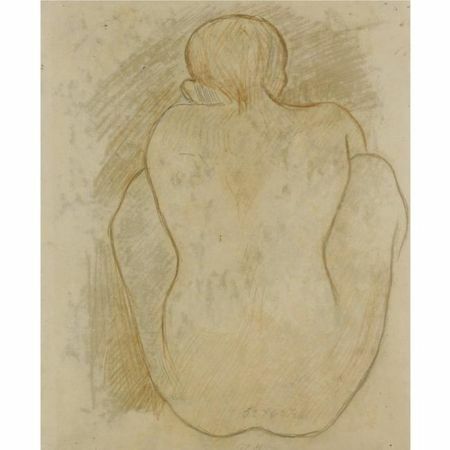 The work has formally been in the collection of the artist Aristide Maillol (1861-1944) and the eminent Gauguin scholar, John Rewald (1912-1994). Aristide Maillol was a friend and supporter of Gauguin, who was influenced by his work; he modelled his terracotta Woman with Crabe of circa 1905 after this pose. Paul Gauguin (1848 - 1903), Le Pecheur buvant aupres de sa Pirogue (G. 46; M. K. J. 33). Paul Gauguin (1848 - 1903), Oviri (G. 48; M. K. J. 35. NOTE: "You were wrong that day when you said I was wrong to say I was a savage. It's true enough: I am a savage. And civilized people sense the fact. In my work there is nothing that can surprise or disconcert, except the fact that I am a savage in spite of myself. That's why my work is inimitable". Oviri means 'wild' or 'savage' in Tahitian. In the primitive mythology of the island, Oviri-moe-aihere or 'the savage who sleeps in the forest' is the goddess of death and mourning. It is also the title of a melancholy song transcribed by Gauguin in Noa Noa, the artist's illustrated journal from his trip to Tahiti. The art historian Christopher Gray saw in Oviri the expression of the 47 year old Gauguin's disillusionment and discouragement: 'all his strength had been poured into his art and he felt that he was no longer making any progresses'. 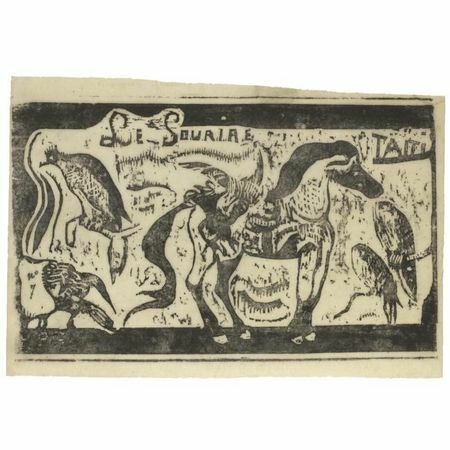 Although the title Oviri is by no means unequivocal, it is clear that the dominant notion is that of the savage and that the word expresses the artist's own attraction to the wild. Here, Gauguin illustrates his desire to reconnect with primitive society, whilst turning his back on Western civilisation from which he had voluntarily exiled himself. One of the most fundamental principles in Gauguin's creative process was repetition. It is therefore not surprising that the present impression is only one manifestation of this mysterious creature. 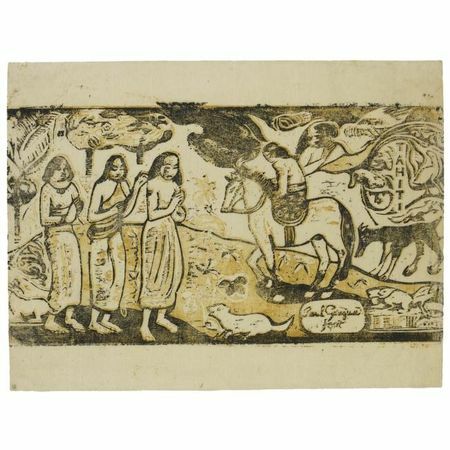 Aside from the seventeen or so uniquely printed impressions of the woodcut, Gauguin made at least one drawing, two monotypes (Field 30 and 31), one related woodcut (M. K. J. 36), two oils (Where are you going, 1892 Staatsgalerie Stuttgart; and The Idol, 1898 The State Hermitage Museum, St. Petersburg) and the famous stoneware ceramic, arguably his greatest work in that discipline (1894 Musee d'Orsay, Paris). 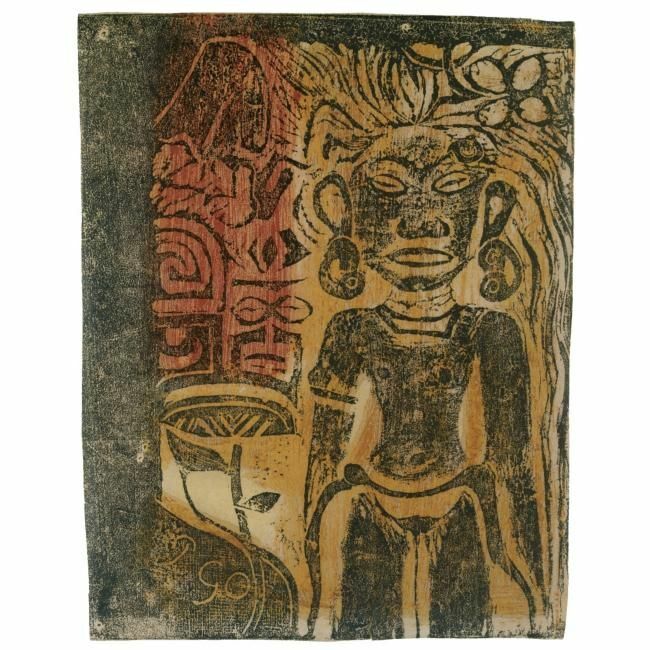 Gauguin referred to the sculpture as his 'Murderess' and asked in one of his letters dated 1900 to Daniel de Monfreid for the sculpture to be sent to Tahiti and placed over his tomb. 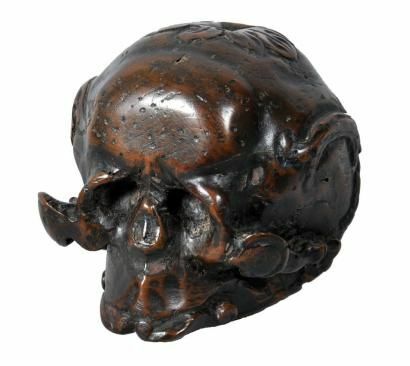 Although Monfreid did not send it, one of the bronzes made from the plaster copy was placed on the artist's grave in Antuona in 1973. A number of exhibitions devoted to primitivism have revealed the influence of Gauguin's Oviri sculpture on Picasso by way of his friend Paco Durrio, the notorious previous owner of the present impression. It has even been suggested that one of the figures in Picasso's Les Demoiselles d'Avignon (1907 Museum of Modern Art, New York) is based on the stoneware ceramic. 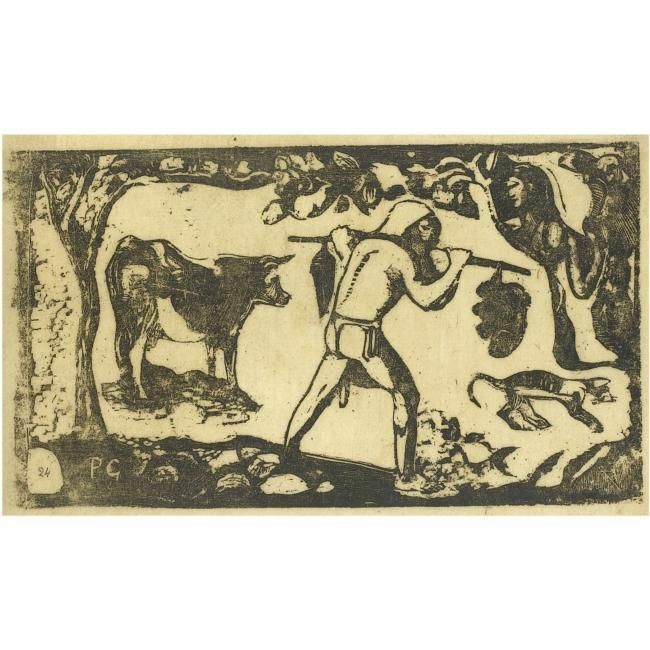 The sculpture as well as various other depictions of Gauguin's Oviri show a woman of monstrous proportions clutching a wolf cub to her hip with a beast, possibly a second wolf, curling in submission at her feet. Gauguin also titled his plaster self-portrait of 1894-1895 "Oviri", making it his allegorical portrait. The plaster is now lost but is known to us through a few later bronzes taken from the model. Gauguin is known for developing his own procedures. 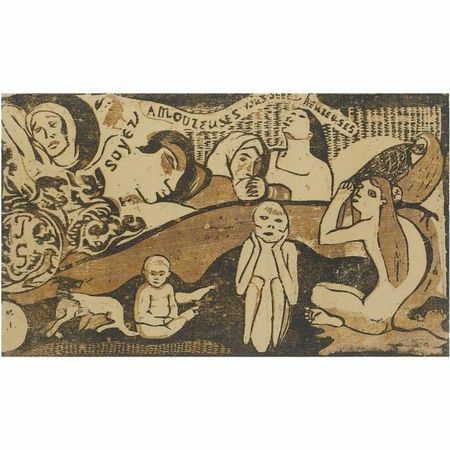 The interplay between monotype, hand-colouring and woodcut is therefore typical of Gauguin's pattern of creativity. Richard Brettel states that "the woodblock for Oviri is unique in Gauguin's oeuvre because of the manner in which it was printed. In Pont-Aven during the summer, Gauguin had experimented with his methods of inking the block. The impressions of Oviri take this experimental inking to extremes that defy description. 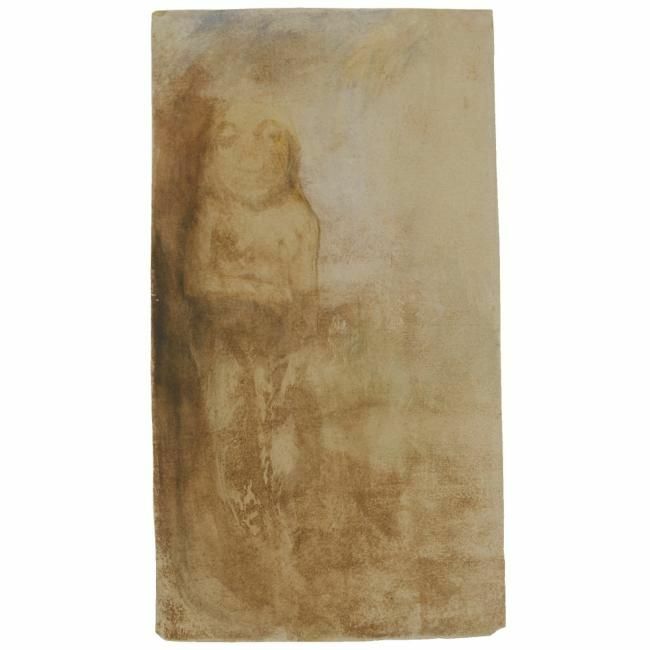 Indeed, most of the surviving impressions seem not to have been printed with printer's ink, but with mixtures of oil paint, ink, and solvents dabbed either on the block or possibly on a secondary support like a rough canvas or cardboard and then transferred on the block. For this reason, the figure of Oviri seems to arise from a primordial ooze of earthy blackness... She is a primal androgyne in a setting that is defined only by the flame like leaves of a palm tree with no trunk, no roots, and ultimately no reality". See Richard Brettel, Françoise Cachin, Claire Frèches-Thory, Charles E. Stuckey, The Art of Paul Gauguin, Exhibition Catalogue, National Gallery of Art, Washington, D. C., The Art Institute of Chicago, 1988, pp. 369-376. Paul Gauguin (1848 - 1903), changement de residence (G. 66; M. K. J. 54). Paul Gauguin (1848 - 1903), Soyez amoureuses, vous serez heureuses (G. 58; M. K. J. 55). 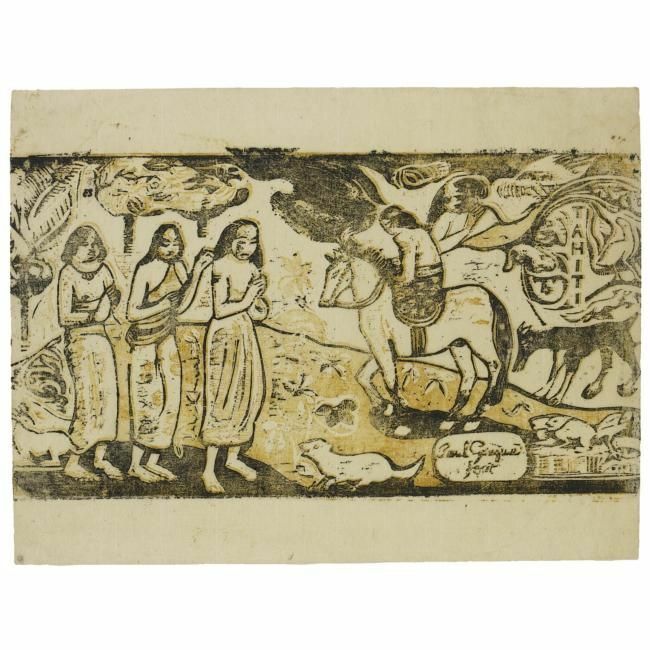 Paul Gauguin (1848 - 1903), Te Atua (les dieux) (G. 60-61; M. K. J. 53). 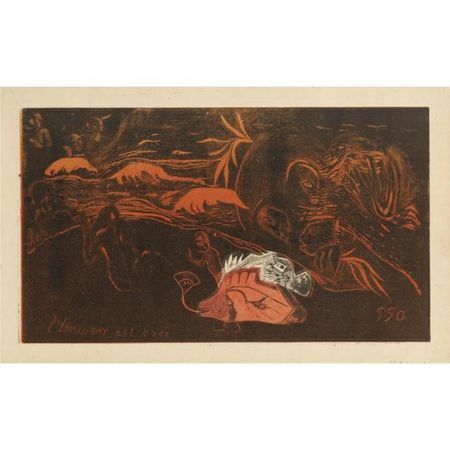 Paul Gauguin (1848 - 1903), Projet pour une Assiette: Leda (G. 1; M. K. J. 1). Rare lithograph with watercolour and gouache hand-colouring in white and olive green, 1889, signed in pencil, inscribed Dessins Lithographiques by the artist, from the first edition, on canary yellow wove paper; sheet: 296 by 246mm; 11 5/8 by 9¾in Estimate 25,000—35,000 GBP. 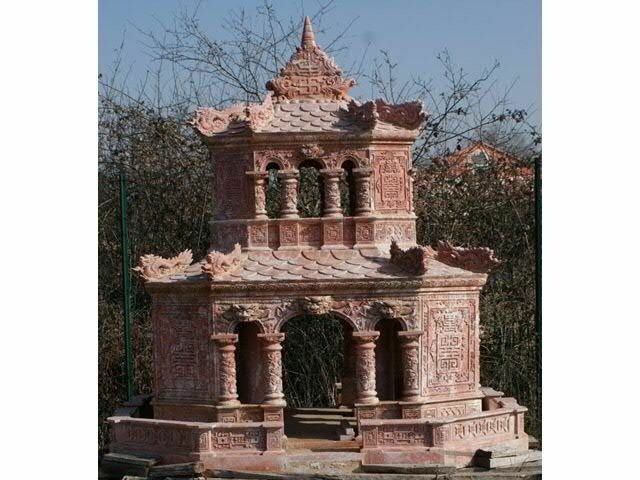 Lot Sold 32,450 GBP. 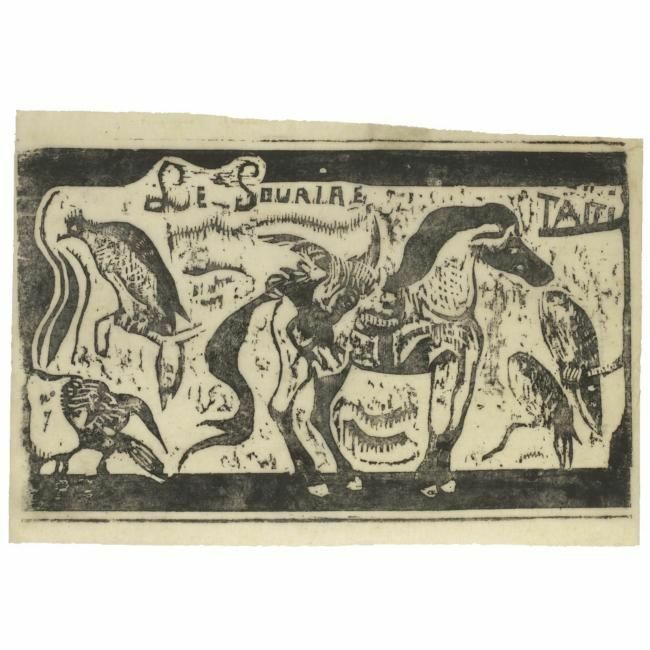 NOTE: The first printed work the artist ever produced, this rare lithograph served as the cover for Gauguin's Dix Zincographies, an album prepared for the important Synthetist exhibition at the Café Volpini in 1889. According to Boyle-Turner and Josefowitz in The Prints of the Pont-Aven School, unsold proofs of this subject were left uncoloured on large sheets of paper, while impressions such as the one offered here were cut down to fit the Dix Zincographies album covers. It was these trimmed proofs that were coloured with gouache and watercolour by the artist. While the exact size of this first edition is unknown, Kornfeld states that 30-50 impressions were probably produced, and not all of the prints were assembled into albums. A second edition of approximately 50 impressions was published by Ambroise Vollard in the early 1900s. These works were printed in black and white on simili-japan paper. Paul Gauguin (1848 - 1903), L'Univers est cree (G. 93; M. K. J. 18). 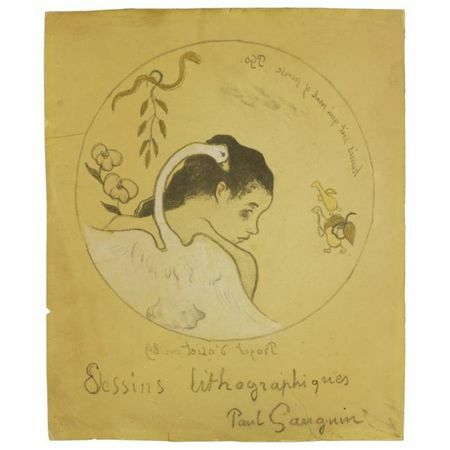 Paul Gauguin(1848 - 1903), Le titre pour 'le sourir' (G. 74; M. K. J. 61). Paul Gauguin(1848 - 1903), Femme Animaux et Feuillages (G. 59; M. K. J. 43).